There are recycling and trash disposal rooms on floors 2-8 and on the penthouse level. They are located midway down the hall to the right of the elevator. On the first floor, it is to the right of the mirror in the lobby. The lobby room has only a trash chute; first floor residents should take their recyclable materials directly to the basement. There are clearly marked containers for all recyclables (see below). Following the instructions on these signs simplifies the work of the building staff, and prevents injuries to individuals as well as damage to the garbage chute and compactor. For more about recycling please visit NYC Recycles. Note: Do not discard appliances on the street without first informing the Superintendent. New York City residents are required by law to schedule an appointment for the recovery of chlorfluorocarbon (CFC) gas, also known as Freon, from refrigerators, freezers and air conditioners. With advance notice, the Superintendent will call the city to arrange for the removal of CFC gas. The only thing that should be put down the garbage chute is regular bagged trash. The following items should never be put down the chute: aerosol cans, anything that is flammable, plants, garden or yard debris, glass of any kind, kitty litter, large or heavy objects, lighted matches or cigarettes, loose dust or vacuum cleaner bags, paint cans or rags, shoes, clothing or fabric and, of course, no wire hangers—they go with metals. 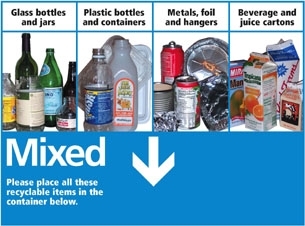 The blue container is for glass, plastic, metals, and beverage and juice cartons. These all go in the same container. Do not put broken glass into the recycling bin. It should be wrapped, carried to the basement and placed in one of the trash containers. 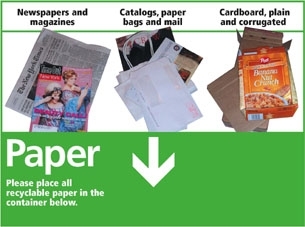 The green container is for all types of paper and cardboard. Large cardboard boxes should be taken directly to the basement. In the basement, please don't block access to the hallway with discarded boxes. If you have very large boxes from furniture or appliances, inform the Superintendent.